Tesco is a large (the largest?) supermarket chain in the UK. I've discovered a bug in their cash register software which results in negative prices. On certain items there is a discount if you buy two items instead of one. That's a fairly standard practice. What's interesting is that the discount on the second item is programmed as a fixed amount, not a percentage. Normally this wouldn't matter; except when the item's expiry date rolls by and they slash the price. The receipt on the left shows the entertaining result. 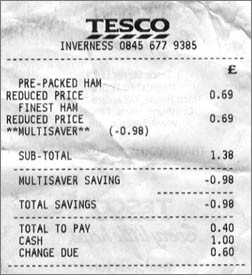 A large quantity of ham past its expiry date costs 69p. But if you buy a second pack, the original 98p discount is applied. The net result is that they pay you 29p to take the second pack. Oops.